World famous restaurant (dt Silver Tower) in Paris on the left bank of the Seine near the cathedral Notre-Dame de Paris. Supposedly it was founded in 1582 by a cook named Rourteau. The top-floor dining room overlooks Paris and the Seine. Famous early regulars included the three French kings Henry III. (1551-1589), Henry IV (1553-1610) and Louis XIV. (1638-1715), as well as cardinal Richelieu (1585-1642) and the noble writer Marie de Rabutin-Chantal, Marquise de Sévigné (1626-1696). The restaurant is famous for its duck dishes. 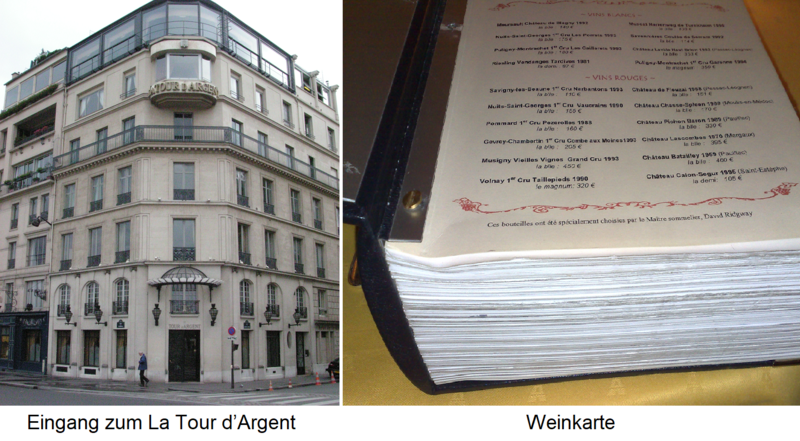 The recipe for the "Canard Tour d'Argent" was conceived in 1890 by the then owner of the restaurant, Frédéric Delair. From the breeding of the ducks, their slaughter over the preparation to the serving of every detail of the court great care is given. Thus, the duck is strangled and thus not bled and is therefore particularly juicy. The sauce is prepared with the help of a duck press at the table of duck carcass and liver. When the German occupiers invaded the open city of Paris on June 12, 1940, Claude Terrail, the son of the then owner André Terrail, with a great deal of foresight, organized a rescue operation in six hours. At the time, 100,000 wines were stored in the cellar of the restaurant. The 20,000 most valuable bottles were walled up in a niche. Among them were many of the 19th century, especially of the famous Châteaux Bordeaux Classification 1855, Soon after, a personal representative of Hermann Göring came to the restaurant to confiscate old wines, because it was known to the Germans, which was hidden here for treasures. The best wines were saved, but 80,000 bottles were robbed. This page was last modified at 20 May 2018 at 11:02.